The flood was the prefiguring of the baptism we now share with Christ, and which we prepare to renew in this holy season. My homily for this weekend is posted here. Once when I was in formation a friar came to teach us about the Eucharist. In an effort to illuminate our understanding of the real Presence of Christ in the eucharistic species, he developed a certain charming metaphor. I had my doubts about whether this metaphor led to a proper Catholic understanding. Last night, to my surprise, I ran into this metaphor for the Eucharist again--in the writings of Ulrich Zwingli! I know I write a version of this same post every year, but you can forgive me or just ignore it. It's just that Ash Wednesday strikes me as one of the most deep and clever rituals we Catholics do each year. Why would we line up to have someone put dirt on our head--in the form of the traced cross we first received as catechumens no less--right after listening to the gospel in which Jesus commands us to wash our face when we are fasting? Receiving the ashes is a deeply ironic, public and stark admission of our sinfulness. We hear the Gospel and then do the opposite of what it says, just like we do all the time when we take God lightly and sin. Today we make a ritual out of this tragedy of our lives. That's why everyone comes to church today, because the ritual itself touches the hard truth that we all know: we have not lived up to the promises that we made (or that were made on our behalf) at our baptism. The power of this public confession of hypocrisy and sin is the first step of our journey to the renewal of those vows at Easter. Tomorrow will begin my seventeenth Lent, and, believe it or not, I have kept records on the observances I have tried to keep, and whether or not they were a material or spiritual success. By material success I mean whether or not I kept the observance, and by spiritual success whether or not it turned out to have any spiritual utility. I have experienced all four possible permutations of success and failure. So, based on my experience as a practitioner of Lent, here are my maxims on discerning a personal observance for this "joyful season." 1. The classic models of fasting, praying, and giving alms are the best starting point. Concentrate on one or do something for each. 4. "Giving up" something that is already objectively sinful doesn't count; ascetical effort at reorganizing our lives to eliminate occasions of sin does. 10. The engineering principle known as the "airplane rule" is useful here: complexity increases the rate of failure. Conversely, simplicity increases robustness. 11. Secret practices are better than ones that will obvious to everyone. Secret saves us from both pride in success and embarrassment in failure. I made my novitiate outside Fond du Lac, Wisconsin, in the northern reaches of the archdiocese of Milwaukee. As Alice Cooper taught us all, Milwaukee means "the good land." During that year, Timothy Dolan appeared as our new archbishop. Now, as I work as a parish priest in the Archdiocese of New York, he is announced again as my new archbishop. Of course this means that His Excellency Archbishop Dolan will soon be His Eminence Cardinal Dolan. Even though today is the stress of gearing up for Ash Wednesday, I'm already looking forward to the installation on Easter Wednesday. Check out this great photo of him over on Whispers. Not only is it cool that he's throwing a pitch at Miller Park, where I once saw a game with a mysterious man known only as "Uncle Runkel," but it gives me great comfort to have an archbishop who sort of knows how to grip a fastball. I had read of it on several occasions, so I was glad to come across a copy of Why God Won't Go Away: Brain Science and the Biology of Belief by Andrew Newberg, MD with Eugene D'Aquili, MD, PhD, and Vince Rause. On the one hand, this is a very interesting book, and I recommend it to everyone who thinks they might be interested in the topic, as well as to anyone who is serious about prayer and meditation. On the other hand, I had some problems with it. The book is brilliant when the authors are writing as scientists, but falls apart when they try to write as theologians. Newberg and D'Aquili report on their experiments studying the brains of people engaged in the religious behaviors of prayer and meditation. They discover that these practices do make a difference for the brain, and go on to conclude that the human brain is "wired" for what we religious folks would call spiritual experiences. The go on to show how such experiences of what they call "Absolute Unitary Being" are actually healthy and adaptive, and how they are distinguished from the religiously oriented delusions of the mentally ill. Thus the authors discount the scientific prejudice that dismisses religious behavior as delusional or maladaptive. They even propose scenarios for the origins of mythology and religion in light of their findings. The great conclusion of the book is to say that the experience of what we would call "God" is just as real for the brain--and, by extension, the self-conscious mind that derives from it (in the authors' assumption)--as any experience of the material world. They are to be commended eternally on their repeated caveat that this doesn't say anything about the existence of God one way or the other. This whole discussion is very interesting. Again, it's worth the read, which is consistently accessible to the lay reader. My only issue with the book comes when the authors move into what I would call a theological reflection. In this, particularly in the final chapter, they take up what I think is one of the great errors of our time. The book suggests that whatever it is we human beings experience in prayer, meditation, and religious ritual, this "Absolute Unitary Being" as they call it, is the referent for "God." They then arrive at the commonly stated theology of religions which states that all religions reach out to this one mystery, experience it, and then try to describe it with different sorts of inadequacy. This is the "many paths" to one spiritual something-or-other kind of thinking that one often encounters. I have written about this before, and I have even heard this "theology of religions" from Catholic teachers and preachers. Indeed, in some ways I think this is the operative super-theology of many people, religious and otherwise. But I believe it to be a grave error. Even when we bracket off its incompatibility with the data of divine revelation, this meta-theology fails on at least a couple of counts. Ranting aside, the authors are to be forgiven on this point. They are scientists, not theologians. Again, when they write as scientists they do so with great objectivity on a topic for which feelings and prejudices run pretty high. If you pray or care about religion, check out the book. Then, as now, we who seek Jesus' teaching, healing, and forgiveness gather at his house. My homily for this weekend is posted here. As time goes on, I hear more and more confessions. I wasn't a priest for four hours before my first penitent appeared, and it has been pretty constant ever since. It's a beautiful ministry and I enjoy it, but it has real challenges. Raised in the therapeutic model, I think we are taught to engage in thoughtful and sustained analysis and archaeology when it comes to reflecting on the movements of the inner person. In confession, by contrast, the confessor must do several things very quickly. He has to diagnose the guilt of the person, often choosing (or letting the penitent choose) among several self-accusations. He must then quickly and succinctly suggest how Sacred Scripture and the tradition of ascetical theology speaks of hope, encouragement, and possibilities for amendment. One thing you notice right away as a confessor is that there are many devout and thoughtful Christians who struggle terribly and with great guilt over habitual sins that have become very ingrained in their daily lives. Many times these might be sins of speech, like speaking without thinking, cursing or "taking the Lord's name in vain," or they might be sins against chastity or "purity." Sometimes such sins are intrinsically serious, but not all serious matter is serious sin. The question that arises for me is the problem of locating guilt. I'm beginning to think that when otherwise serious Christians have their prayer and devotion hampered by bad or sinful habits, it may be a mistake to concentrate prayer and ascetical effort on the sinful behavior itself. As Sun-Tzu put it, the best thing is not to attack the enemy, but to attack the enemy's strategy. This is to say that for Christians who struggle with patterns of habitual sin, the project before them is perhaps not to "cut it out" or "just try harder," but to examine the remainder of their lives surrounding the sin to discover the occasions of the sin and what the sin (falsely) claims to do for them (that is, it's (mal) function). Thus the project goes from negative to positive, from stopping a behavior to re-organizing daily life in order to both reduce occasions of sin and to fulfill spiritual desires well before they turn to the maladaptive behaviors that produce misery and the feeling of alienation from God. This post is a response to a couple things I've read lately. The first is this post from Jeff about the controversy over displaying crucifixes and icons in classrooms at Boston College. As usual, he is a faithful and thoughtful voice for moderation and against the polarizing forces of contemporary Catholicism. When it comes to those who object to displaying Christ crucified at an allegedly Catholic school (!) he writes, "Oh, give me a break! With moonbats like this around, no wonder we have SSPX wingnuts around... Is there anyone sane out there?" Though made in a colorful way, this is a very important point. The second is this post from SFO Mom, expressing her frustration over the lack of seriousness or solemnity surrounding her child's preparation for the full sacramental initiation of Confirmation. I feel for her. So here's my point to the alleged majority of faithful, dedicated and prayerful "left of center" Catholics: I will love you and revere you always because you have raised me, encouraged me, believed in me, and handed on the faith to me. But as long as we treat the deposit of faith and the gift of the sacraments casually, as long as we tolerate the environment of liturgical abuse that makes everyone their own pope, and as long as we give in to the secularizing forces that privatize and marginalize the truths of the faith, frustrated people will react by going just as far in the other direction, and they will find the demagogues you call "ultra conservative" or "far right" with great ease. So if you love the accessibility and inclusion of the Mass of Paul VI and are worried about the remission of restrictions on the old Mass, then let's pray the Novus Ordo Missae together with the reverence that doesn't want to change its words or rubrics. Without the nonsense of liturgical abuses and 'making it up as we go along,' many fewer will seek stability and refuge in the Tridentine Mass. If you are worried about losing the "spirit of Vatican II" to so-called "traditionalist" forces, then let's read the documents of the Council again and pray about how we can put them into practice according to the "signs of the times." And I mean the signs of 2009, not those of 1971. And the so-called "crisis" that is behind my writing today is one of those signs that needs interpretation and action in the light of the Gospel. I've been following the uproar over the auxiliary bishop-elect of Linz, Fr. Gerhard Maria Wagner, who has asked to have his election rescinded. People have been outraged, they claim, because of his comments suggesting that hurricane Katrina was sent to punish the people of New Orleans for their sins. On the one hand, the suggestion is offensive and unacceptable, for reasons I will explore below. On the other hand, there is also the suggestion that the Lentians (?) might not want him for a bishop because he has the reputation of being orthodox and theologically conservative. Wagner's comments about hurricane Katrina reveal a common pitfall in Christian reflection. There are many who reflect with unspeakable pleasure on the punishments that God is going to inflict on other people. But this reveals more about them and their passions than it does about the God who is revealed as the tortured, suffering, condemned criminal on the Cross. In this regard it is providential that we are hearing the Noachide (Noachic?) covenant in the lectionary today and tomorrow. After destroying and re-creating the world with the flood, God receives the sacrifice of Noah and vows, despite the wickedness of human thoughts, never to destroy the world again. True to his promise, when God saw the need to again recreate the world through water, he did not destroy it by a flood but renewed it quietly from within. This is the new flood of baptism, which we receive from and with Christ. The first flood overwhelmed the world into re-creation. This new flood, our baptism, is a quiet and tranquil renovation of the world, but nevertheless an insistent revolution against sin, suffering, and death. Today on the feast of the founders of the Servite order, I keep thinking how it must have been a blast to live in Europe back in the decades surrounding the turn of the thirteenth century. Victorines in Paris, Waldensians in Lyons, Humiliati in Milan, Servites in Florence, Franciscans and Dominicans all over, having professors with names like "Petrus Comestor" and waiting for Joachim of Fiore's third age of the world to appear... all together it must have been quite something. So goes the name of one of my favorite cheap gags, as well as the spiritual condition in which we find ourselves here in the archdiocese of New York this morning. As I have continued to explore Summorum pontificum and what is now called the Extraordinary Form of the liturgy, I have started to have some worries. These concerns have arisen first as little practical, rubrical gray areas that have then led me to more general, ecclesial questions. When can Mass be offered? Current law allows Mass to be offered at any time of day or night, while the prior rubrics (I think) only allowed celebration from an hour before dawn until an hour after noon. So which is in force? Where I live most EF Masses are offered later in the day, after the regular schedule. What about the Divine Office? 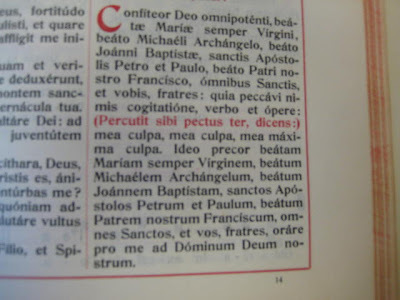 Can I say some of my daily prayers from the 2000 breviary and some from the 1962 one? If I want to use the older one, do I have to say Prime, which doesn't exist in the current Liturgy of the Hours? 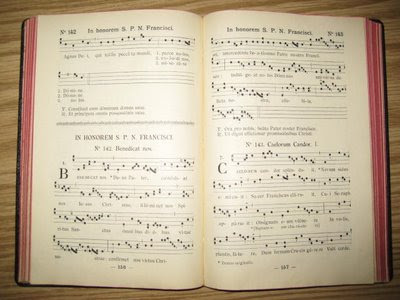 May I say just one of the little hours, as current law provides, or do I have to say all three as the pattern of the Breviarium Romanum expects? And what about altar girls? In what now has been retconned into being called the "Ordinary Form," baptized females can enjoy the ministry of acolyte-by-privilege. So could a girl in an alb or cassock and surplice altar serve at the Extraordinary Form Mass? This last question gets at the heart of my current concern, because I suspect that for most "stable communities" adhering to the 1962 Missal the question would not even arise. They wouldn't think of having altar girls because they are attached not just to a particular liturgy but to a certain kind of Catholic cultural and thought world that does not include this practice. To argue the benefits of altar girls is not my point, though. If we were to move beyond the idea of seperate praying communities to a communion in which the two expressions of the one Roman rite are 'mutually enriching' in a single parish community, will we be able to settle these kinds of questions? Or will they expose us as not really having an argument about the way we are able to pray best, but about deeper cultural conflicts within Catholicism? Will we be able to do better than just getting along? And to the usual erudite readers: please correct my rubrical errors. I'm still learning this stuff. When he went among the lepers and had mercy on them, Francis of Assisi reports that what "was bitter was changed into sweetness of soul and body." We too are called to heal the exclusions and divisions in our society and to transform ourselves in the process. My homily for this weekend is posted here. Well, today I have offered my first Mass in the Extraordinary Form. I'll share a few of my many thoughts and feelings. I was very self-conscious a lot of the time, trying to recall all of my practicing, watching and reviewing of how to offer the Mass correctly. Even though I have practiced with no small diligence, I still stumbled on certain words and phrases, most disastrously on both instances of the famulorum famularumque tuarum. Having added the amice and maniple to my usual vestments, I felt much more vested than usual and was self-conscious about that. Through all of the signs of the cross and other gestures of the Mass, I began to see the clear utility that the Roman style chasuble would have over the gothic one I was wearing. Most of all, I was self-conscious about keeping the custody of thumbs and forefingers from the consecration to the ablutions. I didn't find it physically difficult; I had practiced doing things like page turns and chalice pall manipulation with second and third finger. But, still, it was new. I can see clearly, though, that this practice, once one was used to it, would produce a deep sense of the particular holiness of that part of the Mass that is prayed before the Body and Blood of the Lord. That Christ is, in some sense, secretly present in the consecrated elements of the Eucharist does not make the Eucharist a secretive event. I offered the Mass for the folks who made this video, which I received for free and was more helpful than anything else in my efforts to learn the Extraordinary Form. Tonight our high school drama group had a Ramones tribute band play in the church hall for a fundraiser. I couldn't help but bring my 10-hole Docs out of retirement for the occasion. Luckily for everyone, I couldn't find my braces to go with them. When a few kids tried to start an old-fashioned circle skank a couple of times, I couldn't resit and joined right in. Let's hope there's no photographic evidence. Nobody wants to see the moshing of an overweight friar in his late thirties. The Franciscan rule is famous for its spiritual seductiveness and elegant simplicity. It is easy to desire but hard to put into practice without making glosses and concessions. "And wherever there are brothers, who know and become aware that they cannot observe the rule spiritually, the should and can have recourse to their ministers." It sounds great, but it takes a lot of trust and humility in practice to go to another friar--one who has fraternal and canonical authority over you--and say that you need help in observing the life you have promised. Someone looking after my soul lent me Thomas Dubay's Deep Conversion/Deep Prayer, and I read it last week when I wasn't feeling well. It's an inspiring little book, and worth the time for anyone who has become complacent and needs a little kick in the spiritual pants. Dubay sets the tone for the book with this quote from St. Bernard: "There are more people converted from mortal sin to grace, than there are religious converted from good to better." He then develops this thought in an effort to deliver the reader from complacency and to convince us that we ought to drive ourselves on to become saints. To replace serious sins with regular spiritual practice is just the beginning; we should spur ourselves on to total devotion and complete sanctity. Be committed to meditative and contemplative prayer. I know that he is a popular spiritual writer, but this is the first book by Dubay that I have read. It was enough to get me intrigued, though, so I'll be looking for more. I am shocked this morning to read on the front page of The New York Times that indulgences are back. I had no idea that they were gone! All this time I have acted as if indulgences were an ordinary and useful aspect of Catholic doctrine and practice. I did my best to obtain the Portiuncula indulgence when I was there the summer before last, for example. I have even made announcements at the end of Mass to remind the faithful of opportunities for plenary indulgences, such as for the Pauline Year or All Souls Day. In all seriousness, though, I think that the doctrine of indulgences--the idea of the remittance of temporal punishment for sins for which the guilt has already been forgiven--is one of the most beautiful in our Catholic tradition. Why? Because the doctrine of indulgences proclaims a universe in which the store of goodness far outweighs the accumulation of evil. The doctrine suggests that in the cosmic battle between good and evil, the scales and the chances are tipped so far to the side of goodness that this "extra" goodness can be made available to ordinary sinners in an utterly generous and gratuitous way. "Fr. Charles was sick, Peter's mother-in-law was sick, and they were sick together." RS: I'm sorry, Father, it's my first time. C: (surprised) You're first time ever? RS: (apologetically) No, but the first time in a long time. C: (relieved) O.k. ; The Body of Christ. Then, seeing his thumb and forefinger set in the dreaded "pincers" gesture, ready to grab the host from me, I motioned it towards his mouth. He got the idea and received on the tongue. It's funny; in my growing up in religious life I have often detected an indirect and largely unspoken doctrine that pastoral ministry is supposed to make you more loose about rules and less concerned about church teachings and procedures. In the place of these, you become more "pastoral." For whatever reason, this hasn't happened to me. Besides, I find this colloquial meaning of "pastoral" somewhat offensive. My role as ordinary Eucharistic minister is a good example. My experience as a parish priest has made me more aware and strict about how I minister the host at Mass. If someone does not respond to the address, 'The Body of Christ' with the 'Amen,' I don't give it to them until they do. I do not accept common alternative forms of the 'Amen,' such as "Thank you," and "Yes, Sir." If someone does not present their hands at least above their navel, I act like I don't see them and try to communicate them on the tongue. I do the same thing when people present the "pincers," ready to grab the host from me. As one of my very first (and best) friar teachers liked to say, "Sacraments are given and received from one member of the Body of Christ to another. They are not grabbed, taken, or passed around in a circle." I do not hesitate to leave my station and follow people if I don't observe some indication that they have consumed the host. I enjoy being known for my willingness to do this, and I hope it encourages people to consume the host promptly. After all, we are supposed to consume the host before we even turn around! Apart from all these trials and difficulties, I continue to find this ministry nearly overwhelming in its depth and beauty. To look into someone's eyes and proclaim them the Body of Christ is an intense act of reverence and intimate regard. As I have written about before, I feel intensely privileged to be given the ministry of reverencing and offering to God all of the stories of joy and pain I see in each set of eyes and each pair of hands. I love to find spiritual advice in unlikely places. One of my favorites is my voicemail menu. Each time I call the enthusiastic voice invites me to press four to "change my personal options." Of course this a faulty description. Within the voicemail I can adjust things for which there is an option, but I can't change the options. Nevertheless, each time I check my voicemail I'm reminded that the gift of the spiritual life is to be able to do just that: to change one's personal options. Just because we can exercise choice in how we fulfill our particular seflishness and our patterns of venial (God forbid, mortal) sins doesn't make us free persons. Nobody who is truly free chooses what makes him miserable. 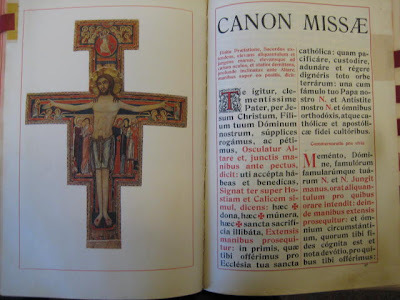 Today I was delighted to come across a scan of Learning the New Breviary by Fr. Bernard Hausmann, SJ. There seem to be a growing number of good resources for learning the Extraordinary Form of the Mass (low Mass, specifically) but I haven't seen much for learning the 1962 Divine Office. I haven't heard it mentioned much, but Summorum pontificum art. 9 gives Latin rite clerics the general option of saying their prayers this way. The copy that someone scanned is from the old Capuchin novitiate library in Milton, Massachusetts. Small world! Check it out over at Churchlatin.com. The book was published in 1961, which means it's in public domain unless the Jesuits renewed the copyright, which I doubt. Ok, I can't help but throw a rant about the Superbowl slogan, "believe in now." It is the nature of now that you don't have to believe in it; now is the given, the self-evident. A cat or an infant knows the now and they organize their lives in response to it, but they don't have to believe in it. It's a given. The trick is to believe in the future, and the really special work is to believe in the future in such a way that it permeates and draws the now into it. That's what it means to believe in the seedling Kingdom of God, or in that classic sign and event of the end-times, the Resurrection. This feast of the Presentation/Purification of Mary/Candlemas is the conclusion of the Epiphany season in the traditional calendar. Back at the beginning of winter, at the darkest time of year we proclaimed the "true light, which enlightens everyone" which is "coming into the world." (John 1:9) Now, forty days after Christmas, at the midpoint of astronomical winter and the traditional beginning of Spring in some places, we return to a reflection on the Light arriving at the Temple. For whatever reason I'm very fond of this feast. May the luminous cloud of God's glory fill us, his Temple, and make us into the Light of the world, the Body of Christ risen from the dead. The Superbowl party is to friar life as the celebration of Christmas is to the secular world. It is a required observance in which the correct rituals and menu are of paramount importance, but even passing concern with the actual event being celebrated is entirely optional.